A Short History of Denver covers more than 150 years of Denver's rich history. The book recounts the takeover of Native American lands, the founding of small towns on the South Platte River at the base of the Rocky Mountains, and the creation of a city, which by 1890 was among the nation's major western urban centers. Leonard and Noel tell the stories of powerful economic and political leaders such as John Evans, Horace Tabor, and David Moffat, and delve into the contributions of women, including Elizabeth Byers and Margaret (Molly) Brown. The book also recognizes the importance of the city's ethnic communities, including African Americans, Asians, Latinos, and many others. 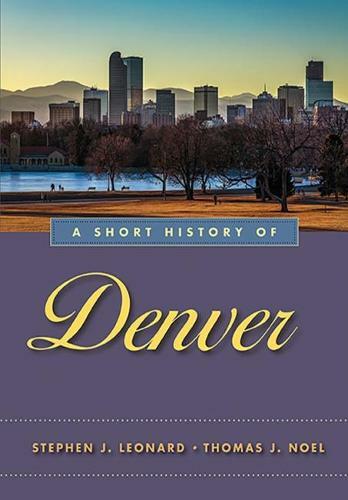 A Short History of Denver portrays the city's twentieth-century ups and downs, including the City Beautiful movement, political corruption, the rise of the Ku Klux Klan in the 1920s, and the Great Depression of the 1930s. Here readers will find the meat and potatoes of economic and political history and much more, including sports history, social history, and the history of metropolitan-wide efforts to preserve the past.